This morning I had the pleasure of visiting and speaking with Saint David's alums in Hume South who were here at school to learn about and help promote Horizons at Saint David's. All members of our Junior Advisory Board--Ben Singleton, Luke Jenkins, Rawson Faux, Peter Sughrue, James Flexner, Gian Fanelli, Chris Wirth, and Lincoln Foran--are working hard for the program. This coming year they will be organizing several events in support of Horizons. Watch out for Save the Dates. If you're an older alum interested in getting involved, contact John Dearie or Meg Sheridan and they'll set you right. In the photo you can see the young men visiting a Horizons classroom and meeting some of the boys they are supporting through their generous outreach. 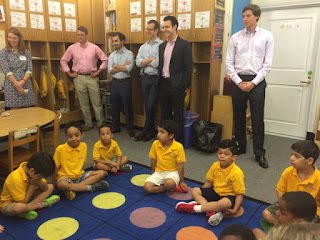 Saint David's boys, now post-college young men set up in their professional fields, returning to contribute to the greater good--does it get any better than that! This past week the first shovel was placed in the ground on 89th Street directly related to the expansion and consolidation of Saint David's School. An auspicious beginning to an exciting journey. Eight years of planning and preparation have officially ended and a building begins. Saint David’s School will continue this pre-major construction work on Graham House through the remainder of the summer. The work this summer involves the roof of Graham House, sidewalk vault repair, and the capping and replacing of water mains running under 89th Street. The work will continue throughout the summer in a series of phases. All should be complete before the start of school in September. In the photos you'll see the scaffolding and protections in place. In our fourth year, Horizons at Saint David's welcomed 67 boys from five Harlem schools across four grades. 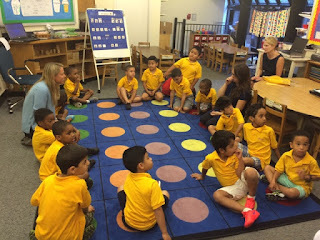 The school is humming with activity this summer as boys work, learn, and socialize with each other. Horizons continues to grow. This summer, eight teachers are coordinating the homerooms with five teachers working as specialists in science, music, art, and athletics. A reading specialist oversees the implementation of the comprehensive reading program. Nine Saint David's alumni volunteers support the program daily, along with three Saint David's teacher volunteers. Horizons is administered by a team of three. First graders are learning about plants. Last week during STEM time they planted wheatgrass that has already grown several inches. A highlight for fourth grade boys is their study of simple machines. In addition, Lynn Wright and The Actors Company Theater (TACT) have teamed up with our fourth grade boys and their teachers to teach improvisational theater techniques. As part of their study, the boys visited the Classical Theater of Harlem to learn about their performance of Shakespeare's "Tempest" and get a behind-the- scenes look at the stage. Following the Saint David's tradition of team sports during athletics time, the third and fourth grade boys now have sports together, facilitating a four team rotation for games. It has proven to be a very exciting part of the day. Second grade boys are studying insects and using Beebots in their STEM classes. Third graders are learning about rockets. This summer, they will design and build their own rockets and launch them in the backyard testing height, speed, and velocity. During Friday afternoon assemblies, several boys from each grade are recognized each week for something special. The second, third, and fourth grades last week traveled to Marymount's Fab Lab to learn about circuits. For our fourth grade boys this is their fourth summer in the program. They have grown so much academically, socially, and emotionally. The program is a smashing success. This Wednesday morning is an Open House, drop us a line if you'd like to view the program in action. A group of our rising Sixth and Seventh Grade boys recently spent a week at the New-York Historical Society in a summer camp program offered by Saint David's in collaboration with the Gilder Lehrman Institute of American History. 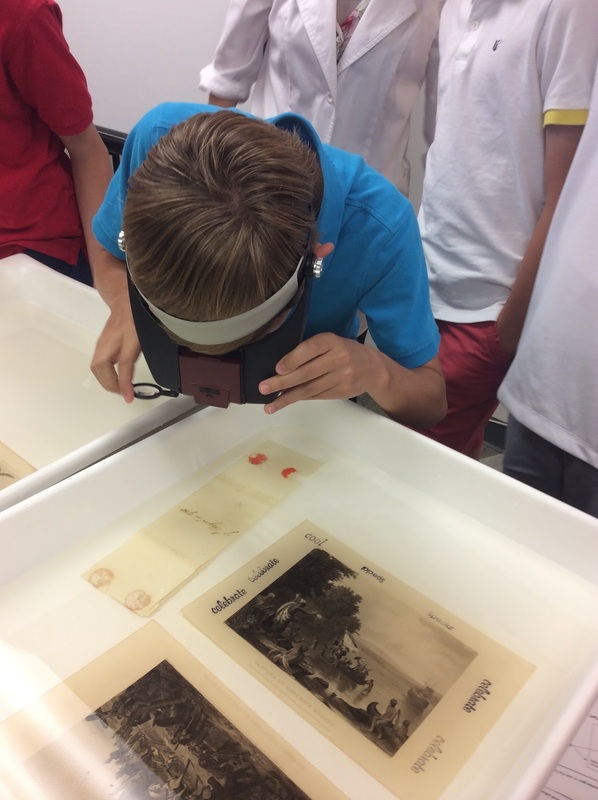 The boys were thoroughly engaged all week long, as they learned about the conservation and handling of original documents through first-hand observation and examination of materials in the Gilder Collection. In one session, an archivist with GLI taught the boys how paper is treated for preservation and the boys were able to experiment with the process using actual documents from the 1700s. 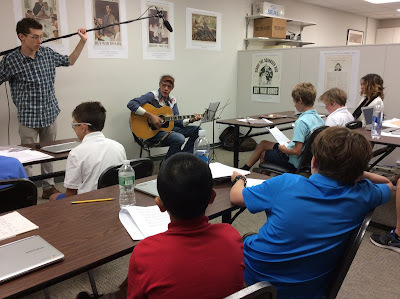 In another session, Sheriff Bob, an expert on early American music, played his guitar and sang songs with the boys. During the week, the boys examined documents related to slavery and abolition, reading original letters and journals on those issues, while focusing on the items as historic artifacts. After having incredible access to GLI's collection of original letters, periodicals, books and artifacts, the boys worked in teams of two to identify a theme and prepare a presentation for parents and guests using Google Culture. This camp augmented the experiences the boys had this academic year, when they visited the Gilder Collection in conjunction with their study of American history.